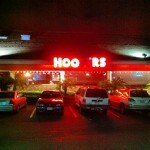 Our directory has 317 Hooters locations. Fantastic! I loved it and I hope Christina is going to serve you, since she's very cute and very pleasant! Ask for Shelley! She's awesome! And if wings aren't your thing, try the Hooters salad. It's delish!